The Las Vegas Review-Journal reports that two militia members from Montana and one from Utah have arrived at Cliven Bundys ranch. Payne said that militias from New Hampshire, Texas and Florida are likely to join and stand with Bundy and stay at his ranch. They all tell me they are in the process of mobilizing as we speak, Payne told the Review-Journal, adding that hundreds of militia members are expected. The Review-Journal also reports that Bundys son, Ammon Bundy, was shot with a stun gun by law enforcement officers Wednesday and that the ranchers sister, Margaret Houston, was pushed to the ground. I pulled the tasers out of him, Cheryl Teerlink told the Review-Journal. Lawmakers are adding their voices into the fray, criticizing the federal cattle roundup fought by Cliven Bundy who claims longstanding grazing rights on remote public rangeland about 80 miles northeast of Las Vegas. Sen. Dean Heller of Nevada said he told new U.S. Bureau of Land Management chief Neil Kornze in Washington, D.C., that law-abiding Nevadans shouldnt be penalized by an overreaching agency. Republican Gov. Brian Sandoval pointed earlier to what he called an atmosphere of intimidation, resulting from the roundup and said he believed constitutional rights were being trampled. The federal government has shut down a scenic but windswept area about half the size of the state of Delaware to round up about 900 cattle it says are trespassing. BLM and National Park Service officials didnt immediately respond Wednesday to criticisms of the roundup that started Saturday and prompted the closure of the 1,200-square-mile area through May 12. Its seen by some as the latest battle over state and federal land rights in a state with deep roots in those disputes, including the Sagebrush Rebellion of the 1970s and 80s. Nevada, where various federal agencies manage or control more than 80 percent of the land, is among several Western states where ranchers have challenged federal land ownership. The current showdown pits Bundys claims of ancestral rights to graze his cows on open range against federal claims that the cattle are trespassing on arid and fragile habitat of the endangered desert tortoise. Bundy has said he owns about 500 branded cattle on the range and claims the other 400 targeted for roundup are his, too. U.S. Rep. Steven Horsford, D-Las Vegas, noted that BLM officials were enforcing federal court orders that Bundy remove his animals. The legal battle has been waged for decades. Kornze, the new BLM chief, is familiar with the area. Hes a natural resource manager who grew up in Elko, Nev., and served previously as a senior adviser to Senate Democratic Majority Leader Harry Reid. Sandoval, a former state attorney general and federal district court judge, weighed in late Tuesday after several days of media coverage about blocked roads and armed federal agents fanning out around Bundys ranch while contractors using helicopters and vehicles herd cows into portable pens in rugged and remote areas. No cow justifies the atmosphere of intimidation which currently exists nor the limitation of constitutional rights that are sacred to all Nevadans, the governor said in a statement. Sandoval said he was most offended that armed federal officials have tried to corral people protesting the roundup into a fenced-in First Amendment area south of the resort city of Mesquite. The site tramples upon Nevadans fundamental rights under the U.S. Constitution and should be dismantled, Sandoval said. BLM spokeswoman Kirsten Cannon and Park Service spokeswoman Christie Vanover have told reporters during daily conference calls that free-speech areas were established so agents could ensure the safety of contractors, protesters, the rancher and his supporters. The dispute between Bundy and the federal government dates to 1993, when land managers cited concern for the federally protected tortoise and capped his herd at 150 animals on a 250-square-mile rangeland allotment. Officials later revoked Bundys grazing rights completely. Cannon said Bundy racked up more than $1.1 million in unpaid grazing fees over the years while disregarding several court orders to remove his animals. Bundy estimates the unpaid fees total about $300,000. He notes that his Mormon familys 19th century melon farm and ranch operation in surrounding areas predates creation of the BLM in 1946. Since the cattle roundup began Saturday, there has been one arrest. Bundys son, Dave Bundy, 37, was taken into custody Sunday as he watched the roundup from State Route 170. He was released Monday with bruises on his face and a citation accusing him of refusing to disperse and resisting arrest. A court date has not been set. His mother, Carol Bundy, alleged that her son was roughed up by BLM police. Meanwhile, federal officials say 277 cows have been collected. Cannon said state veterinarian and brand identification officials will determine what becomes of the impounded cattle. My understanding is this man and his family have been using this land for well over 100 years, then the BLM was created and steps in and starts charging him for it's use. Sounds like Ex Post Facto law to me. Is BLM borrowing an army from homeland security, or does every single department in the us government just happen to have their own army? This is getting crazy. Wonder if we could rename the country United Tin Horn Dictators of America. They’re also stupid beyond belief. Bringing in snipers and shooter over flippin’ cows. Its hard to argue against Bundy when the feds wont lift a finger to remove illegal alien trespassers from land that doesnt belong to them but use such force against freeping cows. Democrats cannot stand the bad press so close to elections in November. These things have a way of escalating out of control all on their own. However, no worry, the press will work overtime to bury it as much as possible and spin what they can't bury. I wish them all the luck in the world, and they’re going to need it. And so are we. God owns all the land. If Bundy’s family has made use of it since the 1800’s then in my eyes it’s theirs until THEY sell it. I don’t know if Jeff Head was there but I drove out from Colorado and distributed some Tyranny Response Team t-Shirts. They were well received. I saw the strutting badge monkeys up close and personal. Obama has a pen and a phone. That is his idea of the rule of law. Holder has been found in contempt of Congress, and contempt of court. Argue all you want about the rule of law, it no longer exists. What did your precious rule of law do for the Weaver family? What did your rule of law do for the Branch Davidians? Who went before a jury for using a tank to smash and burn 86 men, women and children alive? The ABA tried to get a count of federal laws. They could not. In the USA today laws are to punish political enemies, while protecting political allies. See Jon Corzine, exibit A. Paying off the feds won’t work. They have already spent many times the back fees playing Gestapo. This is not about money, it is stamping on a rebel to make an example. So first understand that the land belongs to the US Government. People were grazing on federal lands without the government’s permission before the creation of the Taylor Grazing act (1934). At that time, Congress decided to start charging a fee for grazing on their land. In that law, they created the Department of Interior Grazing Office for the charging of fees to graze on US Government lands. This office was later rolled into the BLM. 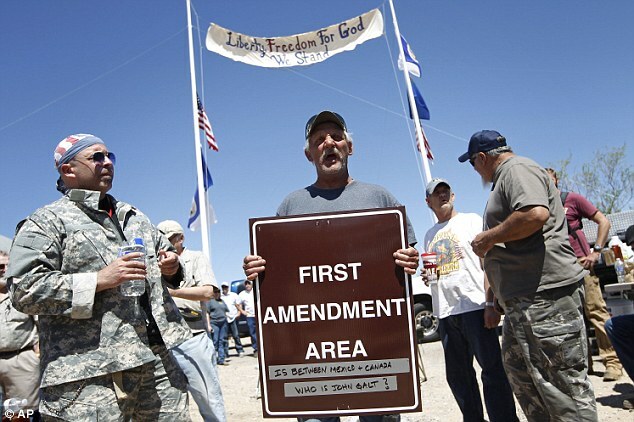 It is government land, the Congress has exclusive legislative authority over that land per Article 1 section 8 of the constitution, and they decided to start charging fees and for a while, Bundy was paying those fees. That is called “squatters rights” or “adverse possession” and is in clear violation of the principles on which this nation was built. Be very careful supporting such laws as it would be easy enough for someone to take land from you by using such laws. And in this case the government has repeatedly gone to the courts allowing Bundy to state his case. Bundy has repeatedly lost his case because he does not have a legal leg to stand on. Interesting times ahead my friends. That actually happened to a friend of mine. With respect to the BLM killing cows though ... in the video, he says that this round-up is taking place during calving season. The BLM doesn’t know enough to pair up babies and mommas. So now there are babies out there without mommas because the BLM rounded up the mommas. Then he makes the point that if the desert tortoise has rights so do the calves. Day-old babies with no milk. This story gets worse by the hour. Just like “first amendment zones”. How legal is that? Tazing people for peacful assembly and speaking out is a violation of our Constitution. Care to adress that? Care to address the death of the law? May your chains rest lightly, and the boots you lick taste good. According to the family, the fees were originally supposed to be used only to assist the local ranchers. Well, the family is wrong about that point. The fees and grazing contracts were created under the 1934 Taylor Grazing Act. The Act provided that receipts from grazing be distributed three ways: 50% to range betterment projects, 37½% to the US Treasury, and 12½% to the state. So, no. The fees were not originally supposed to be used only to assist the local ranchers. The Bundy family has owned a 150-acre ranch since 1876. Ownership of the 150-acre ranch is not in dispute. What’s in dispute is grazing rights to hundreds of thousands of acres of public land to which the BLM asserts title. The Bundy family says an ancestor bought permanent grazing rights to the old Bunkerville allotment in 1887. They have not said from whom they purchased it nor, for the skeptics, produced any document of conveyance. Bundy is now grazing on the old Bunkerville allotment as well as additional land to which the BLM or the National Park Service claims title. I read that the feds were supposed to relinquish most of the federal lands when the territories officially became states. That's a legal argument Cliven Bundy made in court, based upon Pollard's Lessee v. Hagan, 44 U.S. 3 How. 212 212 (1845), in which the U.S. Supreme Court addressed lands ceded to the United States from Virginia and Georgia to discharge debt incurred by those states during the Revolutionary War. The USSC ruled that that the United States held this land in trust for the establishment of future states. Subsequently, federal courts have ruled that Pollard's Lessee was based on the fact that Virginia and Georgia were sovereign entities before becoming states, and specifically ruled in four cases that it did not apply to land in the State of Nevada, because the U.S. owned the land before Nevada became a state.